You must be a member of the Sydney Sport Activities & Leisure Group to attend this activity. Would you like to join this group? Join two of Australia’s leading shark experts, diver and conservationist Valerie Taylor and neuroscientist Dr Richard Gates in conversation discussing their unique understanding of how sharks think and behave. Internationally renowned filmmakers Sally Aitken and Bettina Dalton will also be screening exclusive excerpts from their upcoming biopic on Valerie - The Real Jaws, which charts the diving legend’s life over 5 decades. 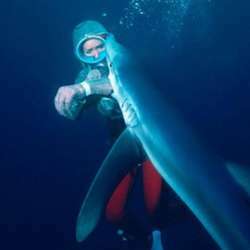 How have attitudes towards sharks evolved over time, why did Valerie evolve from shark hunter to shark lover and how can we reflect on our relationship with sharks today? This fascinating evening will be hosted by the maritime museum’s Daina Fletcher, curator of contemporary Chinese art exhibition On Sharks & Humanity. Note: Ticket includes light refreshments and exclusive access to the On Sharks & Humanity exhibition between Protected content .